← Mini set of the month update! Exciting things are happening at Heather’s Yarn Barn! A lot of exciting things are going on in my shop recently! 1. I’ve teamed up with www.Zulily.com, we are running a campaign beginning April 14th-17th. I have selected 10 of my colorways for them to sell on their site and what’s even better is they are offering you amazing customers a HUGE HUGE discount from my normal retail price. So if you’d like to try my hand-dyed yarns, this is a great opportunity to do so. Be sure to mark your calendars and grab some skeins before they sell out. I’ve provided a sneak peek of the colors that will be on their site come April 14th! 2. 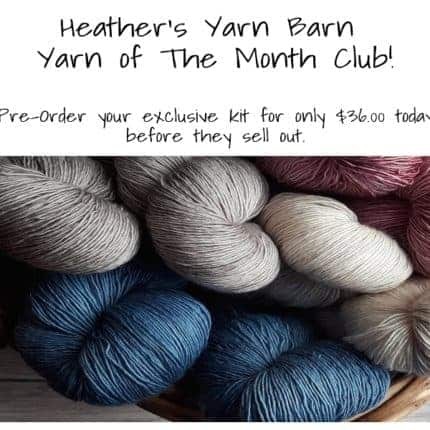 Heather’s Yarn Barn is now offering a monthly sock club called Yarn of The Month or YOTM for short. Right now I’m taking preorders for May. The theme for May — HINT — APRIL SHOWERS BRING MAY FLOWERS. Each month you will be shipped a super special sock yarn kit. You will receive one skein and one mini skein. Who doesn’t love contrasting socks, am I right? 🙂 Now mind you, each month you will get to knit or crochet with a colorway that isn’t available in my shop. I’ve made these yarns special just for this club. Dates to order are 1st-14th of every month. After that, you won’t be able to place an order. I will then begin dying, labeling and bagging each order! The expected shipping time frame is no later than the 15th of the next month. Share what you got!